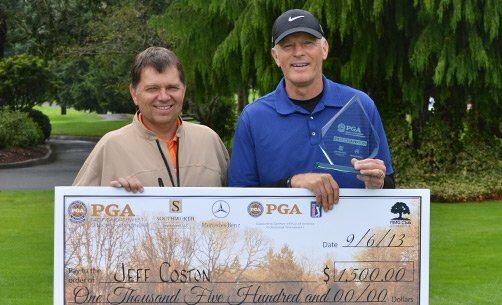 PGA Professional Jeff Coston of Semiahmoo G&CC (Blaine, WA) won the Senior PGA Championship in a playoff against PGA Professional Tom Sovay of Redmond Ridge GC (Mukilteo, WA). The two professionals fired a 137, 5-under par score for the two days. PGA Professional Bill Tindall of Aldara Golf Club (Falls City, WA) won the Senior Division by one stroke over PGA Professional Rick Adell of Bellevue, WA. PGA Professional Ron Stull of Union, WA won the net division. Sovay, Chuck Milne, Brent Murray, Scott Cravens, Jeff Fought, Scott Krieger and Tom Staskus (plus Coston) qualified for the 2013 Southworth Senior PGA Professional National Championship at Creighton Farms & River Creek Club in Virginia – October 10-13, 2013. The Pacific Northwest Southworth Senior PGA Professional Championship is under way at the RMG Club at Oakbrook in Lakewood, WA. We have our top senior PGA Professionals all vying for the title of Senior PGA Professional Champion and not only the opportunity to add their name to the list of champions but to also advance to the Senior Professional National Championship this coming October 10-13. Chuck Milne of Vanco Driving Range (Vancouver, WA) is leading the Senior PGA Championship after firing a first round 67, 4-under par. He leads by one stroke over Tom Sovay of Redmond Ridge GC (Mukilteo, WA) and Jeff Fought of Black Butte Ranch (Sisters, OR). Rick Adell of Bellevue, WA and Bill Tindall of Aldara Golf Club (Falls City, WA) are leading the Senior Division after firing a first round score of 71. The top seven players (plus Jeff Coston) are playing for a chance to qualify for the 2013 Southworth Senior PGA Professional National Championship at Creighton Farms & River Creek Club in Virginia – October 10-13, 2013. The Senior PGA Professional Championship is a 36 hole individual competition. The top 8 finishers in our Section PGA Professional Championship will advance to the 2013 Senior PGA Professional National Championship at Creighton Farms, Aldie, Virginia and River Creek Club, Leesburg, Virginia on October 10-13, 2013. Jeff Coston is already exempt for the Senior Professional National Championship after winning this event in the past. As a new feature to our tournament program, results will be posted at regular intervals throughout the day at https://www.pnwpga.com/results/resultssrpga13.html “Almost live scoring” will begin at 10:00 am each morning after the groups begin turning. Be looking to see if one of your friends posts a low score!